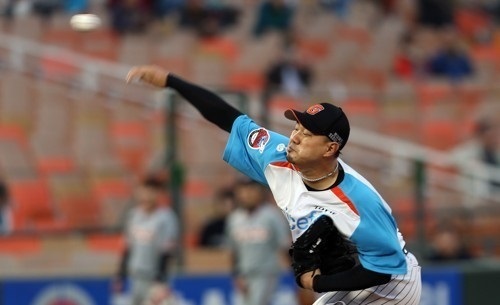 Lotte Giants starter Song Seung-jun allowed only 2 runs in his Tuesday night start against the LG Twins, but the 2 runs were all LG starter Kim Dae-hyun and the LG bullpen would need as they blanked the Lotte offense for a 2-0 victory. Song scattered two walks and nine hits over his five innings, striking out six. He fell to 6-3 on the year, but improved his ERA to 3.75. LG shortstop Oh Ji-hwan drove in the only runs of the game with a second inning home run and a third inning double, going 2-for-2 with two walks. The loss meant that Song will have to wait until his next start to reach the 100 career wins mark. Song would be only the 28th player in the Korean Baseball Organization’s 37-year history to reach that mark, first achieved by Samsung’s Kim Shi-jin in 1987, and most recently achieved by Kia’s Yang Hyeong-jong earlier this season. Song debuted with Lotte in 2007, and has remained with the team throughout his entire career, primarily as a starting pitcher. Song’s prime was from 2008 to 2013, where he won 71 games, including winning 12 or more games in five of those six seasons. Since 2014, Song has struggled with inconsistency and injuries, including missing the entire second half of the 2016 season. He began the 2017 season working out of the bullpen, but started the season strong and moved back to the starting rotation by the end of April. The KBO has announced they have planned a special award ceremony for when Song reaches the 100-win mark.